PT Yamaha Indonesia Motor Manufacturing (YIMM) officially launched the latest generation CBU All New Yamaha YZF-R1 in Indonesia. 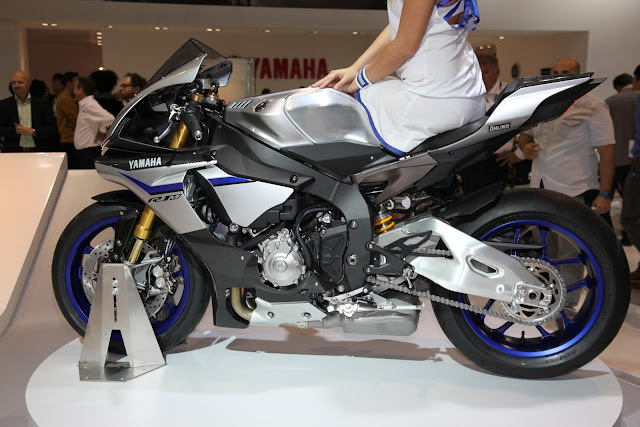 The motor output is YZF-R1 2015 and YZF-R1M. Both were launched in celebration of automotive, Gaikindo International Auto Show (GIIAS) in 2015 which took place in Indonesia Convention Exhibition (ICE), BSD City Tangerang. M Abidin, General Manager of After Sales and Motor Sport YIMM, say when YZF-R1M is a special version of the all-new YZF-R1, because it bears the title of mass production motorcycle ever produced the highest spec Yamaha. "YZF-R1M is a motor that is capable of removing the true potential of the all-new YZF-R1 at the race track. It has also been demonstrated toughness in the event the prestigious Suzuka 8 Hours race in Japan," said Abidin, Saturday, August 22, 2015. Although one generation, all-new YZF-R1 and YZF-R1M have some differences, including the use of tires, cowling, Racing Electronic Suspension (ERS), ECU data logger. The advantage for the owner of the all-new YZF-R1 and YZF-R1M includes free service for 3 years or 36,000 km for oil, oil filter, air filter plugs, batteries, brake, and others. In addition, the offer of 3 year warranty from Yamaha Indonesia, road assistance, emergency service for 3 years (24 hours / day, 7 days / week), bike care (detailling 1 times a year, cleaning after service), pick up service, and home service.